Any story that starts off at a rainbow’s end and winds up in a mother’s cradling arms must have sweetness stamped through it like a stick of seaside rock (or candy cane for the Americans) and so it is with this first book from Christy Hall and Jenney Rabbit. 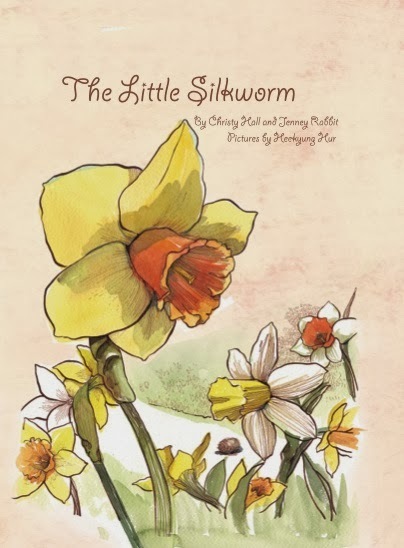 Set amongst a friendly natural environment and in a story lavishly illustrated by Heekyong Hur, our silkworm hero discovers his (yes, this silkworm is a boy) silk-producing purpose in life and learns how his silk can be woven into a soft and nurturing blanket. On his short journey among the surrounding plants he meets challenges that are mostly scare free, though encounters with an ant and a woodpecker do test his resolve and there’s always a niggling doubt, right up until the final page, that he may yet get gobbled up by a hungry bird. Spoiler alert: There’s a happy ending! At approximately a dozen pages of text, the yarn will stretch nicely over 2-3 days’ bedtime storytelling and whilst the publisher’s website suggests the tale is for to kids aged 4-8, it will probably be best appreciated by the younger ones. A cynical 8 year old may not perhaps respect the story’s careful crafting. As the festive season approaches, The Little Silkworm is a gift sure to make any story loving infant wide-eyed in wonder. Available to download from Amazon.